Looking for a one stop shop to outfit your entire football team this season? Do you want a custom design that represents your brand in the best possible way both on and off the field? If so, then what you're looking for is Uniform Store's professional grade design and complete football team package set. This is where we work closely with you and your program to customize and deliver the highest quality and best looking team uniforms and practice gear that closely resembles what the NFL teams use. Who wouldn't like the thrill of football? Resisting the charm of this tough sport will be hard. Another charm of this sport is the colorful uniforms. Football teams' uniforms reflect players' true pride of their teams. These unique uniforms can make players experience a true sense of belonging to a bigger entity. From young to senior football players wearing a team uniform is an essential matter. It is an endless source of pride and is always connected to good memories and accomplishments. A football uniform is a loyal friend to all players in every step of the way. 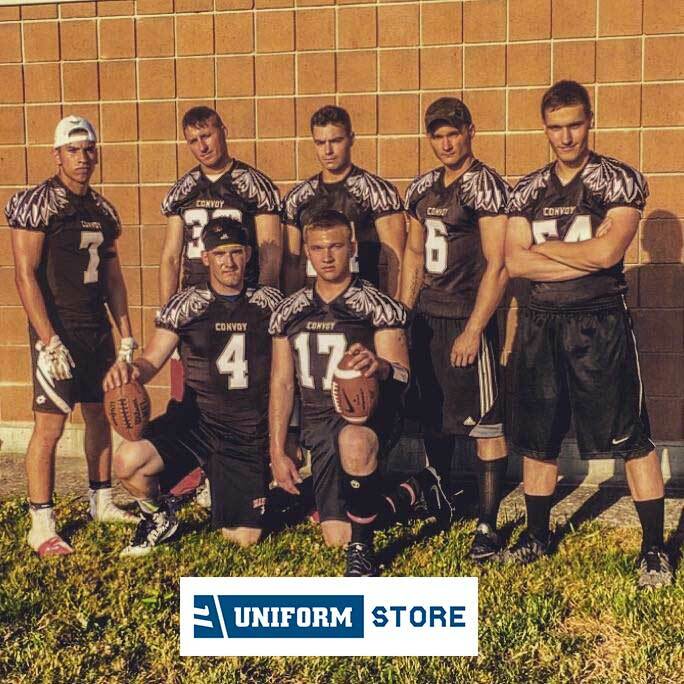 Selecting the right uniform from our collection of football uniform sets is an important step in your journey with this competitive sport. Every football player must look for a uniform made of comfortable materials. Being on court requires serious effort and sensible amount of tough intervention. This can make players sweat a lot. The right football team uniforms must be able to totally absorb the sweat and let it evaporate very fast, so it won't make player feel any sort of discomfort. The material of a team football uniform must be durable to withstand the tough interaction between players. A basic football uniform set consists of football jersey and pants, protective helmet for the face and head and pads for shoulders, thighs and knees. The perfect football uniforms are made of nylon and tricot mesh. This material is able to perfectly fit any given body sizes, so players feel the ultimate freedom in running and scoring more goals. Also a stylish appearance will make players feel more confident and powerful. This kind of confidence can boost the players' performance in all games. Football jersey and pants are available for players from all sizes and ages. Knowing your exact size will help you find your perfect team football uniform. This uniform contains a unique mix between viper jersey and revolt pant is made for ambitious players. This jersey is made of the high quality tricot mesh, so it will entirely fit the body. The revolt pant is made of nylon spandex, which will let players run completely freely. This football uniform set is for real processional players. The magnum jersey and its matching magnum pant will help players give their ultimate performance. It is made of the excellent Tricot Mesh material, which can absorb sweat very quickly. The uniform comes in countless colors and sizes. As the name suggests storm jersey is made for players to run like the wind. This uniform will be suitable for classic football appearance. This unique mix between storm jersey and mach pant is made of the powerful tricot mesh and nylon spandex. This uniform set is available in multiple colors including maroon, cardinal red, gold and Vegas gold. This uniform has a unique gift; Branded Style Compression shirt, which you can complete the perfect classic look. The havoc jersey is an outstanding football jersey set that fits the body perfectly. It has a perfect design that will make it hard for your opponents to grab or hold you. As for the football uniform pants, destroyer pants will make the running and scoring experience a total blessing. You have ultimate freedom to choose the suitable design and color you wish. This uniform is the first member of the force fusion family. The entire family is made of the high quality tricot mesh fabrics. This uniform is made for players who are looking for special and exclusive appearance. The team football uniform comes in limitless size collection. The size collection starts with the Youth Extra Small and ends with adult 10XL. The second member of the fore fusion family. Its unlimited design and color collection will make you have a unique look that will blow the minds of your competitors. The uniform is one of the football uniform packages that come with a gift. It has a stylish Mascot Compression Shirt. This is the third in the force fusion line. The uniform is made of the high quality tricot mesh, which can absorb all the sweat without making you feel itchy. The uniform set is going to be fully compressed against your body. This feature will make you feel light and unstoppable on the court. This uniform is the latest member in the force fusion line. The uniform package is made of tricot mesh fabric, which can handle the tough intervention in during the game. This high quality fabric is totally durable. Players who have passion for unlimited customization, this uniform set is what they need. 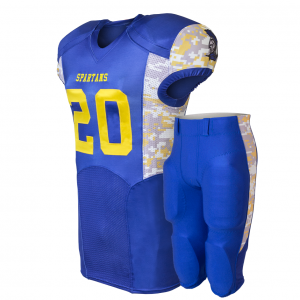 If you are looking to design your custom football uniforms, this set will give 100% customization. From Columbia blue to Vegas gold you can choose the right color for this uniform package. This package is for those who are looking for dominating the game. The uniform set will make your opponents intimidated by your presence. The uniform is made of tricot mesh that will let your hot sweat evaporate quickly and do not stay in your clothes to disturb you. This football uniform set will let you have unlimited options for full customization. This football team uniform will make players feel ultimate comfort. The high quality tricot mesh will let players run gracefully and freely on the court. It is also available in a wide collection of designs and colors.